OAO NOVATEK announced that Arcticgas (a joint venture between NOVATEK and GazpromNeft) launched the Yaro-Yakhinskoye field, which is the third field launched into commercial production by this joint venture. Thirty-seven (37) gas condensate wells have been drilled and the field’s infrastructure also includes a gas gathering network, a gas treatment unit, and a gas condensate de-ethanization unit. The Yaro-Yakhinskoye field is expected to reach its planned daily production level equivalent to 7.7 billion cubic meters (bcm) of natural gas and 1.3 million tons of de-ethanized gas condensate per annum over the next several months. 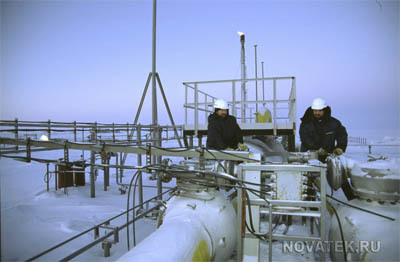 Chairman of the Management Board of NOVATEK, Leonid V. Mikhelson stated: “Within a very short period of time at the Arcticgas JV we managed to launch three large gas condensate fields with an overall production capacity of seven (7) million tons of gas condensate and 28 bcm of natural gas per annum. That exceeds 25% of Russia’s gas condensate production and 4% of natural gas production in 2014. Arcticgas is an important driver for NOVATEK’s production growth in 2015, and the three fields of this joint venture contribute significantly to fulfilling our vertically-integrated gas condensate value chain”.